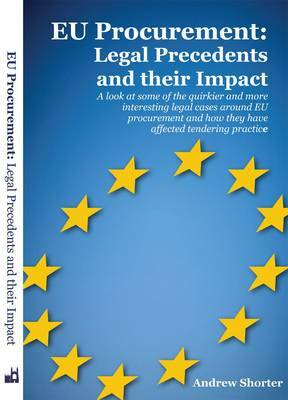 This book explains the impact that some key legal decisions may have on your daily procurement practices: whilst it aims at being readable and at times amusing, it hopes to set some of the requirements of the Procurement Regulations into a practical context and help those tendering to navigate their way through what to some must at first seem like a legal minefield. It isn't, but it does demand thought and care. In addition, it will look at some of the more recent pieces of legislation, purely to help you keep abreast of any changes to your current practice that these new legal requirements may demand. Not only will the precedents and requirements explained herein guide you towards safer and more compliant procurement, it will also, hopefully, enable you to better understand the implications when someone names a case on which current good practice is based. It may even, dare I say, enable you to better participate in discussions on EU legislation at dinner parties and with your peers.